As an Essex girl, born and bred, I'm always intrigued to read books set in the county so that got me interest in reading the blurb of this, along with the fact that it is loosely based on the real life character of Matthew Hopkins 'The Witchfinder General' who is famous for his role in the killing of women in the 17th century around the region of Manningtree, who were thought to be witches. The fact that the evidence against those women - rumoured to be about 300 women in just under 3 years that were killed - was based mostly on rumours amongst villagers or even the fact that woman had a birthmark or mole - evidence enough for the witchfinders to condemn the women to hang. In this book we follow the story of Alice, his sister, who in 1645 moved back to Manningtree to see her brother after the death of her husband. Her brother had always been strange and seen as different from a child, as he was badly burned in a fire as a child, but when Alice returns she notices a much darker side to his personality and learns of his life now as a witch finder and that he is killing women, but legally!. Alice as a character in herself, is also an extremely interesting woman as she has dealt with much trauma in her life and her attempts to keep her brother from his quest is a brave one but a reckless one. 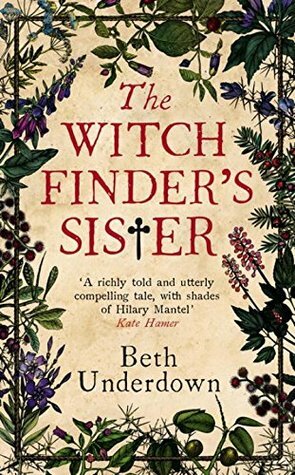 He takes her out on his witch hunts to help with the 'interrogation' and it is quite harrowing to read of what he makes her do, and what the women under suspicion have to endure. She also begins to learn more of her recently deceased mother, and her father too which adds more depth to the story and shines some light on their troubled childhoods. I really loved the pace of this book - it is a little slow at times, but that really helps the characters build and gives you a great insight to life at the time and in the surrounding areas which are wonderfully brought to life as his quest to hunt out more witches picks up pace. It never goes over the top and deals with subject matter in a calm and understated way. It is fascinating to take a person from history and create a story around someone who there isn't much known about his persona or personal life, and I think it works so well in this book to create an imagined storyline - it cleverly feels very real as the story picks up pace towards the end and I am now also inspired to read more about the Witch Trials and how this sad period of history was allowed to gather such pace. A fascinating and well written debut and I look forward to reading more from the author in the future! I will definitely be buying a copy of the beautiful hardback version to have on my bookshelves!